The secret to these classic buttermilk biscuits? Two kinds of flour. 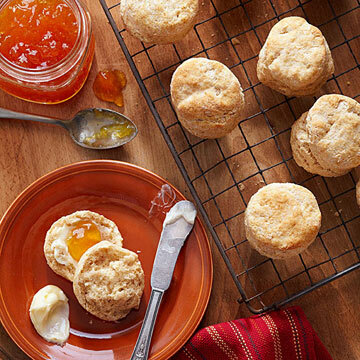 Blend all-purpose and wheat flours for biscuits with fuller flavor. In a large bowl, combine the whole-wheat and all-purpose flours, baking powder, baking soda, and salt. Cut in shortening until mixture resembles coarse crumbs. Make a well in the center. Add buttermilk or sour milk all at once. Stir until just moistened. Turn dough out onto a lightly floured surface. Gently fold and press once or twice to smooth the dough. (Sprinkle with about 1 tablespoon additional all-purpose flour if dough seems too sticky.) Lightly roll to 1/2-inch thickness. Cut dough with a floured 2-1/2-inch biscuit cutter. Place biscuits, with the edges just touching, on an ungreased baking sheet. Or place in an ungreased 11x7-1/2x1-1/2-inch baking pan. Bake in a 450 degree F oven for 10 to 12 minutes or until golden. Remove biscuits and serve warm.